If you have dreams of growing an organic garden from A-Z, you may want to start at the end with some easy growing, gorgeous zinnias. With broad blossoms, bright colors, and next to nothing to worry about ruining your tending efforts, zinnias are some of the easiest and most rewarding flowers to grow. Learn how to plant zinnia seeds for the best return and make a major impact on your garden or landscape this year. Considering height, color, and shape combinations, there are dozens and dozens of zinnia varieties to choose from. Since it’s so easy to collect seeds from zinnia plants, try sticking with heirloom varieties that will produce reliable replicas year after year. Still, there are lots of options when deciding which zinnias to plant. 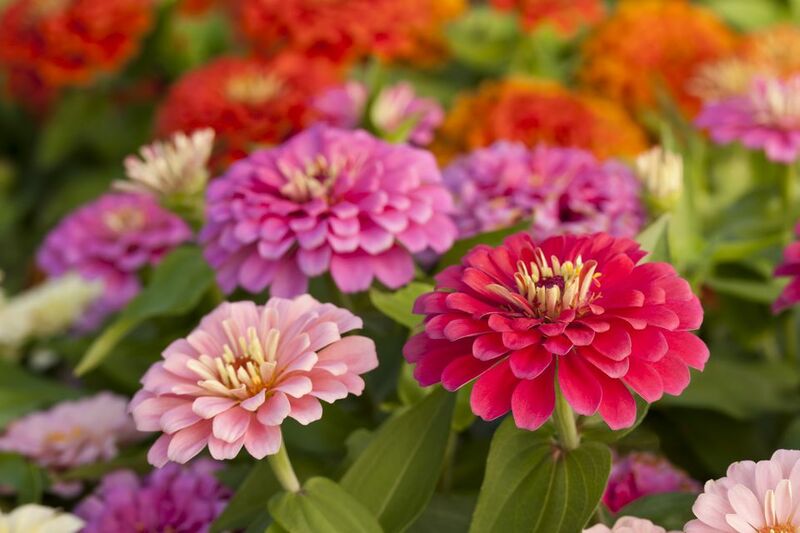 Zinnias come in a range of shape types, including varieties that resemble daisies or dahlias, tight blossoms in beehive shapes, small button blooms, and large floppy blossoms. As a quick, easy annual, you can tuck zinnias around other plants or make a full zinnia patch. Mix up height and color – have fun playing with the many options zinnias provide without having to cater to pickier plants! Zinnias do best in full sun, so gather your collection of zinnia seeds, choose your space(s), and get ready to start your spring zinnias! As a full sunflower that likes warm weather, zinnias need the air and soil to be warmed to the 70s F to germinate and begin to thrive. Unfortunately, they also dislike being transplanted. That doesn’t mean you can’t make the most of the growing season, though. You still have a choice between starting zinnia seeds indoors or sowing seeds directly outdoors. The easiest way to start zinnias is to plant them directly in their final beds outdoors. It takes air and soil of more than 70 F to germinate well, so wait until spring is firmly in place before planting zinnia seeds. Plant them about 1/4” right in the ground, spaced as much as your chosen variety needs, anywhere from a couple of inches to a couple of feet. Once they sprout, thin them carefully to encourage the strongest to thrive. Give enough space so that air can flow around the mature flowers, preventing disease. If you want a jump on the growing season for some early spring color, you can get around zinnia’s aversion to transplanting. Start seeds in potting soil and peat pots about a month before the last frost. Once the soil is warmed enough for zinnias, you can plant the entire pot in the ground for an easy transition. Zinnias like well-fed soil, so some compost worked into the ground early in the season will give the soil an edge before it’s time to get the zinnia seeds or plants in the ground. Moisture is important in early weeks, but make sure it doesn’t get soggy. Zinnias will last for around two months, so stagger multiple plantings in the garden in order to keep zinnia flowers in the garden from spring through fall. Heavy humidity might be your only obstacle to constant zinnias all summer long. It’s hard to pinpoint a real challenge to growing zinnias. Resistant to pests, happy in most soils, and prolific bloomers, zinnias are very nearly “set it and forget it” plants. Water and sunlight will keep your zinnias blooming full and frequently. Too much water, on the other hand, will risk one of the only diseases zinnias are susceptible to: mildew. Keep water to about an inch a week, from all sources. And, as with most plants, avoid spraying the foliage and flowers as much as possible and not at all during the heat of the day. If you want full, bushy zinnia plants, pinch the top of the stems off of young plants. If you want to encourage tall zinnias, stake the largest so they don’t flop over. “Harvesting” zinnias as cut flowers will also encourage full growth, telling the zinnia to keep producing blooms until some are able to go to seed. Cut the stems above leave or bud nodes and the stems will keep growing and producing new blooms. Once a zinnia plant is done, you can remove it and plant something else in its place. For heirloom varieties, let one or two go to seed and be sure to collect them for next year. Try to save seeds from zinnia plants that are tucked behind others to avoid having dying zinnias as a focal point.